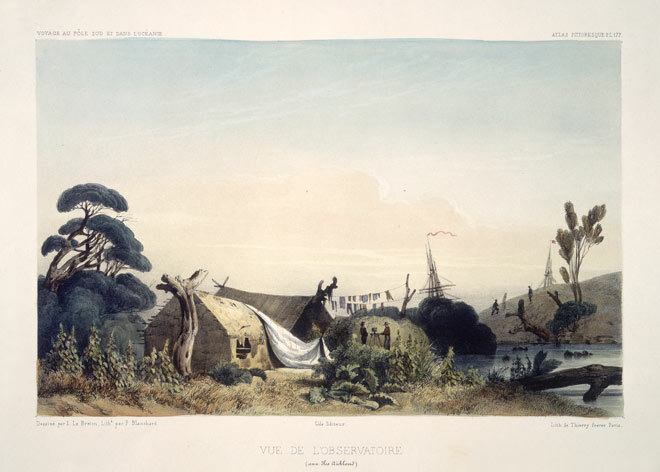 In March 1840 French explorer Dumont d’Urville visited the Auckland Islands as part of a voyage to Antarctica. In this lithograph based on an artwork by Louis Le Breton, Dumont d’Urville’s ships, the Astrolabe and Zélée, are visible in the background. In the foreground two men work with an astronomical instrument on a tripod. The site is Port Ross. It was one of three scientific expeditions to visit the islands that year – the others were the American expedition led by Charles Wilkes and Sir James Clark Ross’s British expedition. D’Urville had visited and charted New Zealand 13 years before.